The Ecohog EH1500-TWS is the newly designed mobile Ecohog windshifter offering a four way split separation. Some of the new features to this machine include hydraulic AirHog suction system, enclosed lights conveyor for eliminating airborne material and optional magnetic head-drum. The Ecohog Razorback Starscreen Box is available in both static or semi mobile options with a range of features. The screenbox is ideal for achieving an additional split to the primary screen. The unit can be supplied as hydraulic or electric. The Ecohog HogMag HM-ECS-2000 working in waste wood clean up. The 2m static unit is processing over 40TPH and achieving 99% separation. The unit is equipped with an AirHog Suction System to remove the Superlight fraction from the material. The Ecohog 2m tracked HogMag ECS brings ferrous and non ferrous metal separation to an even higher level. Compared to the 1500 wide unit productivity is increased by 30% making it ideal for the waste processor with high volumes of waste material. The Ecohog Airhog Max is the latest suction technology designed to capture a higher volume of material without comprising on the quality of separation. The EH1500-M4T Tracked Windshifter is working with a Komptech Trommel Screen in Compost Cleaning. The EH1500-M4T a four way split machine designed to remove Superlight and Light Fractions such as plastics and paper leaving a Cleaned Compost. The Ecohog EH1500-M4T 4 way split Tracked Windshifter processing C&D /C&I waste separating the superlight, light and heavy fractions. The Ecohog EH-81 AirHog Suction Separator is working is Constuction and Industrial Waste removing the Superlight Fraction. The AirHog stand alone suction system is designed for the removal of low value light weight fractions to further clean many applications. The AirHog EH-81 Suction System removes low value light weight paper and plastic fractions from the remaining compost material. The AirHog incorporates a frequency controlled heavy duty fan, air hose and extraction hood and is positioned over a moving waste stream in this case a conveyor belt enabling the light weight material to blow through the extraction hood into a detachable sock or bin. The Hogwash is a recycling technology that has a proven operational reliability in cleaning and separating material of varying densities through the use of water. The principle separation technique is when the material is dropped into the tank, the clean glass cullet sinks and is conveyed out one side while the lighter fraction including plastic bottle tops and labels floats and is then scraped of the surface of the water by a conveyor on the opposite side of the tank. The Ecohog EH1500-M4T tracked windshifter working in Shredded Compost Oversize. The two Airhog Suction Fan systems enable the removal of superlight contaminants and the light contaminants improved quality separation of the Shredded Compost Oversize. The Ecohog EH1500-M4T Windshifter is a tracked unit with two AirHog Suction fans enabling up to 4 way material split. In this demonstration the Ecohog M4T is working with the Terex 620 Trommel in Trommel fines clean up. Ecohog will be exhibiting at Waste Expo 2016 on the 6th – 9th June in Las Vegas. Come along to Stand 3604 to find out how Ecohog can help you get more $$$ from your waste material. Ecohog are Hungry for Waste! SH-927Øx1524 Scraphog Magnetic Scrapdrum working in a Landfill Reclaim setup to remove the heavier scrap fraction. The setup also includes the Ecohog HogMag Eddy Current Separator and two EH1500-M2 Windshifter Units and a Terex Spaleck. The Ecohog HM ECS-1500 HogMag Eddy Current Separator working in recycled woodchip removing ferrous and non ferrous metals leaving a cleaned woodchip. 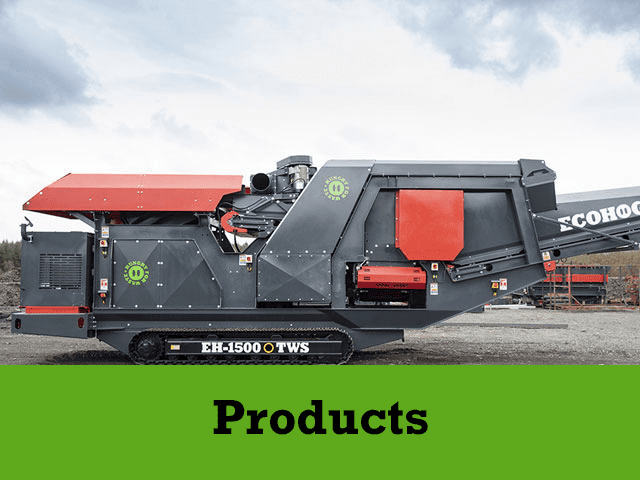 Various machines from the Ecohog product range including two EH1500-M2 Windshifter, a HM ECS-1500 HogMag Eddy Current Separator and a SH-9270 X1524 Scraphog Magnetic Drum working with a Terex Spaleck Screen in Landfill Reclaim. This video was taken in the early stages of setup. The Ecohog EH1500-M2 Windshifter and the HM ECS-1500 HogMag working with a Spaleck Screen in MRF Glass Clean Up separating the glass fraction and recovering the metals. For more information on MRF Glass Clean Up call Ecohog today. The Ecohog HogMag HM ECS-1500 along with the Powerscreen 1400 Warrior are working to de-contaminate the aluminium and steel from the remaining application. The steel is dispersed from the ferrous belt and the Eddy Current Separator then separates the aluminium from the remaining application which can then be sent for further processing. Ecohog EH1500-M2 Mobile Windshifter working in landfill reclaim and C&D / C&I heavies cleanup with a Lindner URRACO 75D mobile shredder and a Komptech Nemus 2700 Mobile Trommel. All filmed from a drone as well! Powerscreen Pheonix 3300 Trommel feeding an Ecohog EH1500-M2 with vibrating pan in Compost Oversize Cleaning. The Phoenix 3300 trommel is the pre sorting machine in this compost cleaning. The smaller trommel fines are removed and the remaining material is feed from the trommel onto the Ecohog EH1500-M2 vibrating feeder pan which controls the volume of material entering the windshifter. This control enables a better separation in the output material from the windshifter. This machine arrangement is achieving 98% contaminate free end material which can be further processed fro Biomass. The HogMag machine incorporates a vibrating pan feeder, eddy current and head drum magnet, and integrated stockpiling conveyors for the various splits. The machine is currently operating in separating non-ferrous metal from contaminated woodchip where the material is reused for fuel (biomass) or chipboard. The Ecohog Windshifter protects the shredder in the separation process from foreign objects such as stainless steel which are to heavy for magnets to extract. The Ecohog density separator ensures only light materials enter the shredder resulting in downtime of machines and maintenance of parts is minimal. The Powerscreen Chieftain 1800 feeding an Ecohog HogMag producing quality recycled wood. This machine combination is durable, low maintenance and can be set up quickly ensuring both machines are operating to achieve a high throughput. The video demonstrate typical usage of the Ecohog Windshifter in trommel fines clean up. In this example the Ecohog is separating +20mm of cleaned stone and the remaining separated lights can be used for RDF material. This video highlights the main stages in a typical C&D recycling processing incorporating trommel use, picking line, crusher, magnet and where an Ecohog can be incorporated and add value. In today’s markets if processers don’t adequately clean C&D material they can lose considerable value of return on their product. The Ecohog ensures that clean product is achieved and revenue maximised. 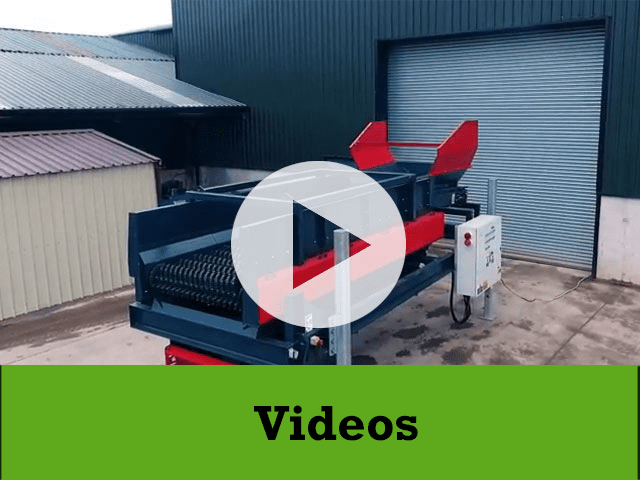 The video demonstrates a crusher feeding a three way split machine which in turn feeds the Ecohog – removing all cloth, plastic, wood etc. contaminant from the product greatly reducing man power needed for separation (cost benefit & health & safety risk minimisation) and adding considerable value to the end product because it’s cleaner. 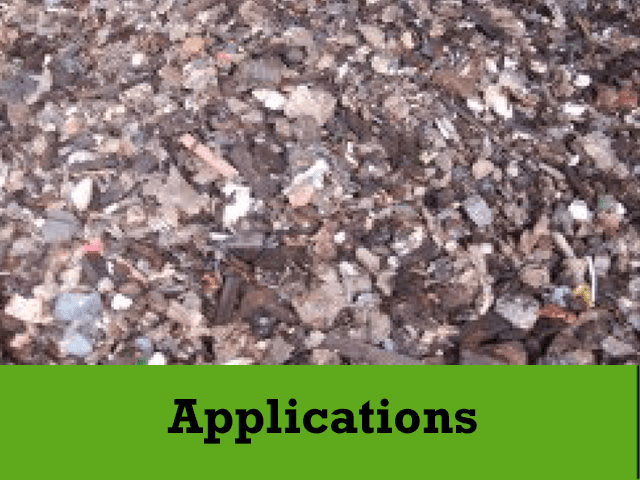 Customers utilise an Ecohog application before the flock shredder to remove all heavy contaminants that down-stream magnets have missed, for example pig iron and particularly stainless steel which would otherwise damage the shredder which would cause considerable downtime as well as wear part costs. The Ecohog Windshifter M3 Unit is fully mobile to allow for ease of transportation between or on sites, in addition it has integrated conveyors and a unique tiger fan suction system ideal for compost oversize clean up. Ecohog units are utilised in landfill reclaim in conjunction with trommel separation to remove fines that can be used as landfill capping. The Ecohog separates the remaining heavy and light material, the light fraction is then further processed and the heavy material used for aggregate. Combining the Ecohog Razorback StarScreen with the Terex V20 Shredder creates a closed loop system to ensure all the wood chip is correctly sized whilst eliminating the need for manpower of reloading the shredder. The output product from the Razorback Starscreen in this operation is Grade P63 Woodchip.